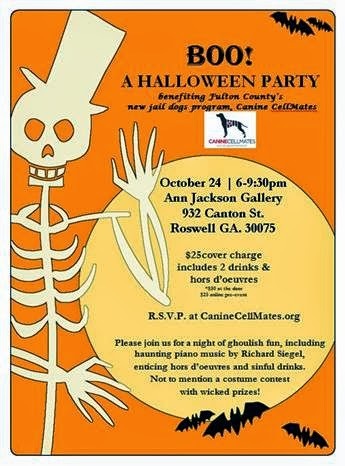 Canine CellMates is hosting a Halloween party on October 24 at the Ann Jackson Gallery in Roswell. The event will benefit Canine CellMates' Fulton County jail dogs program. The Halloween party will feature hors d'oeuvres, drinks, a costume contest with prizes, and Richard Siegel on the piano. The $25 cover charge covers two drinks and hors d'oeuvres. Attendees can R.S.V.P. at CanineCellMates.org.